November was another full month of speakers from around the world at our Youth Clubs - Let’s Chat and Let’s Share! We had our first guest speaker from The Netherlands, Sander Huizer, share with us about Dutch culture and people. Outside of this, November’s chief contributors were from REI-Vietnam, as Zonia Go and Ellen Piencenaves (Philippines) led sessions that invited us to have a growth mentality that fosters a more creative mindset. Then Alyssa Meyer (USA) brought an entirely new topic to us on motivation, which was centered around her passion for dogs and how they respond more effectively to positive reinforcement. She wonderfully demonstrated how, on this front, people might not be all that different! A final REI-VN contribution came from Randy and Jill Vernon, who shared about the differences between introverts and extroverts, helping us to identify what kind of personalities we have, along with their implications. We are truly thankful for the offerings of REI-VN staff! And on that note of thanksgiving, we cannot forget Thang Tran’s (Vietnam) sharing on the holiday itself. Thang facilitated a refreshing time of expressing what we we are all thankful for on Thanksgiving. Finally, we said goodbye to three-time Let’s Share speaker and regular member Alex Joyce, who was to leave for Australia the next morning - but not before he shared one more time with us! Alex communicated, “I can’t think of a better way to spend my last night in Vietnam than to be with my friends at Tea Talk and Let’s Share.” We are grateful for all of these friends from around the world, including those of you who are reading this and continue to support us in any way you can from afar. Thank you all! The loss of a loved one leaves us seeking answers to questions about grief. Our culture is often unhelpful when making our way through the maze of feelings that we experience. Grief truly is a journey of emotions, accompanied by both physical and social changes. On 4th of November, Mrs Cristina Co (MA.Counseling, Philippines) brought to Let’s Talk 8 students a special mentoring session about “Grief & Loss”. This session aims to give participants the language, tools, and materials they need to effectively help people deal with their loss. At the end of workshop, all students wished they could have more time to go further. But the most important truth they received: That comfort and support can make all the difference to your loved one’s healing. While you can’t take away the intense pain of their loss, there are many ways to show someone who’s grieving how much you care and to help them through this difficult time. Be confident with what you have been equipped with, Let’s Talkers! 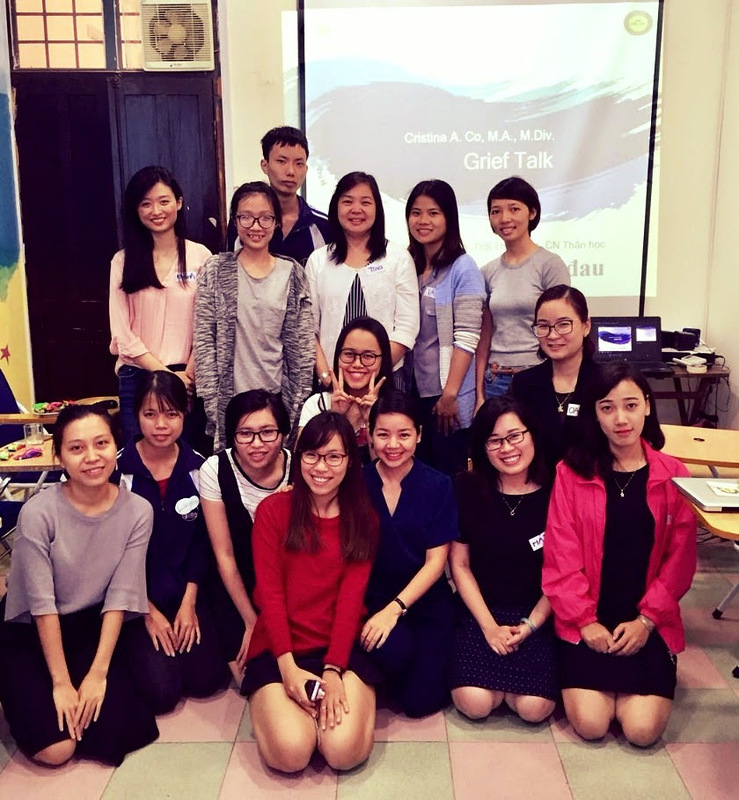 This November, CoRE - the charity arm of Tea Talk successfully implemented the training phase of the Wife Together project in Ba Vi, Hanoi. Wife Together is sponsored by a Young Southeast Asian Leaders Initiative Micro-Grant. This project aims to equip women with skills to work with men to prevent intimate partner violence for 20 staff from Vietnam Women’s Union of Ba Vi suburban district (Hanoi). By understanding gender equality and learning basic counseling skills, trained staff will be able to provide 20 – 40 violence victims with effective support and treatment as well as raise awareness of intimate partner violence among the community. Some of you may have heard that Michael published a book before he left Vietnam for a sabbatical. This is the incredible account of the journey it took for a social venture called Tea Talk Cafe to shift from dream to reality. 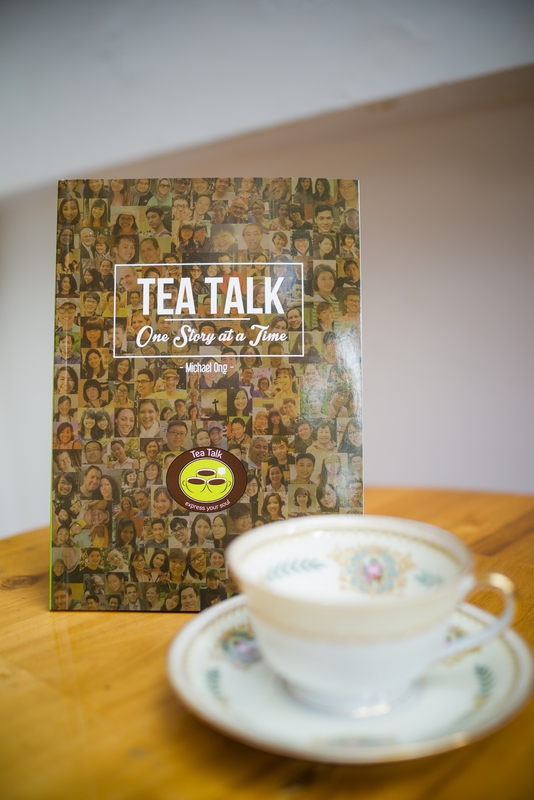 "Tea Talk: One Story at a Time" shows us the beauty and wonder of Vietnam and her people through Michael's challenges of starting up a social enterprise in a foreign land. If you have yet to walk through the doors of Tea Talk, where so many lives have been changed, then let this be your opportunity to have the doors opened to you, with the fragrances of faith, hope, and love touching your nose and inviting you to be the next in line to "express your soul". 📚 Kindly drop Mrs Linda Sim an email at lindasim23@hotmail.com for a copy in Singapore. Tea Talk is a cafe that serves delicious and healthy lunch, homemade desserts and afternoon tea. Our food is freshly prepared with the finest ingredients, and full of goodness in every bite. Homey: It is your home away from home, a cozy atmosphere where you can relax with friends. Quality & Affordability: We believe in providing quality home baked goods at affordable prices. Excellence: We take pride in serving our customers with delight and in providing a clean and smoke-free environment. Social Responsibility: We, together with our customers, are constantly looking for ways to give back to the local as well as the global community. Copyright © 2011: Tea Talk. Simple theme. Powered by Blogger.